From Nottingham, take the A52 towards Grantham and turn right at the traffic lights towards Cotgrave, stay on this road and take the third road on the right (Hollygate Lane), the campsite is 400m on the right. 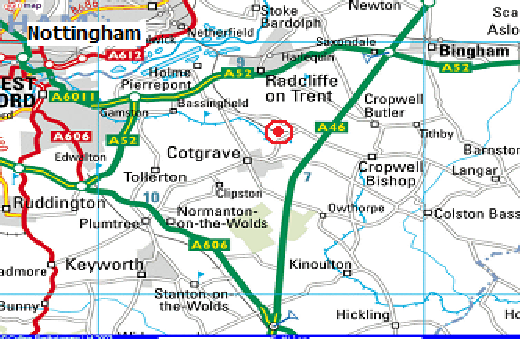 From Newark/Grantham, take the A46 towards Leicester: leave the dual carriageway at the Stragglethorpe junction (signed Cotgrave/Cropwell).Turn right at the first roundabout, straight on at the 2nd then first left (signposted Cotgrave), the campsite is 400m on the right. From Leicester on the A46: leave the dual carriageway at the Cotgrave/Cropwell Bishop junction (NOT Cotgrave/Owthorpe). First left at the roundabout, then first left (signposted Cotgrave), the campsite is 400m on the right. Sorry, the site does not have a post code.